Yesterday I walked out of Walgreens on Market Street and I saw the smoke I was walking into. I’d seen the smoke from the North Bay fires in Napa, Santa Rosa, Calistoga, Glen Ellen, and points between, as I rode over the Bay Bridge that morning. And on Monday, I had been able to see the Golden Gate Bridge through the smoky haze. But yesterday, there was no more Golden Gate Bridge. At least, that is how it appeared in the Bay Area. We were all smoked in. No fog, just smoke. The smoke in the North Bay, as captured by Christina Alva, @expired_data, earlier this week. She lives close to the fires, but, thankfully, far enough away to be out of harms way. We breathed the smoke of woodfire from the North. We worried for friends and coworkers, their safety, their Napa and Yuba County properties. Your eyes water, your sinuses and throat dry out, and the need to drink water is pretty much constant. You imagine how much worse it must be to be there, where the fire has just burnt out the Kmart, the Hilton, the Stornetta Creamery, (the now burned to the ground Stornetta Creamery) your whole neighborhood. The photos and video and eye witness accounts of the Armageddon that struck all of a sudden this past Sunday night are devastating beyond comprehension. The story of the grandparents, 100 and 98 years old, dying in their home as it, too, burnt to the ground, makes you sadder than sad. You grieve for the family. You grieve for the folks who have no insurance, who live on limited means and have lost everything. And you somehow feel a generational memory of the smell of smoke as you walk down Market Street, miles away in San Francisco. My first thought as I walked up the street in the smoke, and smelt the fire? It was that grandpa Ralph was a six year old boy in 1906, as he stood on Market Street and smelt the smoke, and watched the fire as it moved ever upward from the Mission, from the wooden structural fires that were spreading. Spreading, dare I say it, like wildfire. That was a different type of disaster, and today’s fires are quite different. But it put me there for a moment. And then I was remembering the ashes falling in my face* as I skated on a Sunday in Golden Gate Park. The Oakland Hills fire of 1991. I was here for that. Dad had the hose out when I reached him on the portable phone. He was in the driveway of our Oakland Hills home, wetting down the roof and trees that grew close to all of the houses on our street. He had loaded his small Toyota truck with the important bits of the family historical archives that grandpa Ralph and he had curated over the years. Priceless bay area transit history, regional California history, family history. His real fear, I knew, was for the thousands of negatives in metal filing cabinets. Negatives that would melt and curl at the edges and be ruined if the heat and the flames jumped the Warren Freeway, two streets away from the house. Thankfully, the fire that day was stopped before it burnt our neighborhood. And it would have burned the whole canyon if the fire hadn’t been contained. All of this went through my mind in a second or two, as those kinds of thoughts do. And in remembering my fear for my father and stepmother’s safety, and the hope for the saving of our beloved historical collection, I was there again. For a moment only, and it passed. 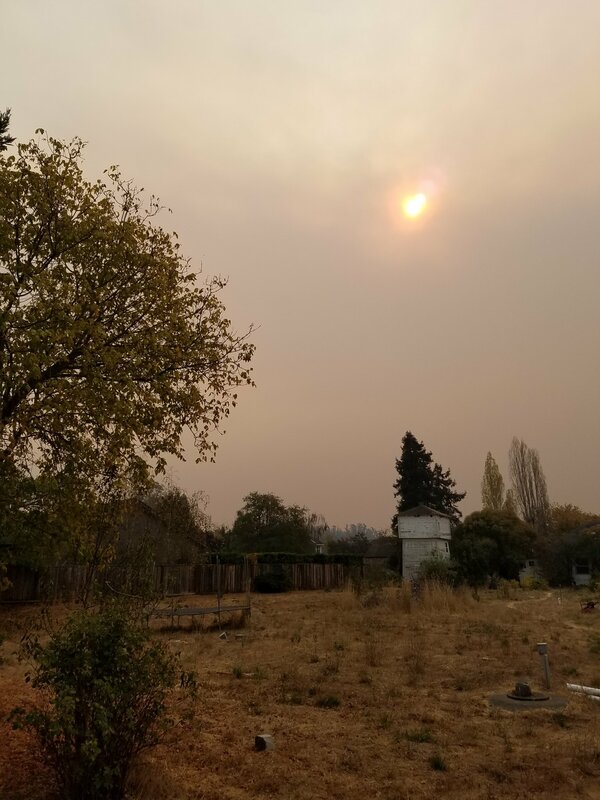 I have lived my whole life in Northern California, and have only ever smelled forest fire smoke when I went to camp as a child on the Central Coast, up in the hills where you expect to smell smoke. Never have I smelled wood smoke on Market Street, in downtown San Francisco. As I write this, in my Oakland apartment on Wednesday morning, I smell smoke through my open window. That smoke has traveled many miles to get in my nose. Today is overcast, but the combined smoke haze and clouds are all orange-pink. The light that filters in through the blinds is the same tint. And the winds are forecast to kick up again as the afternoon turns to evening. I’m keeping an eye of the news and praying for a reprieve from Mother Nature. Sure, us native Californians are used to our share of natural disasters, but enough already, 2017!